>The other day my friend, Charli, who used to live in Memphis but moved to the Seattle area over ten years ago, sent me an email with some great news about her thirteen-year-old son, Patrick. 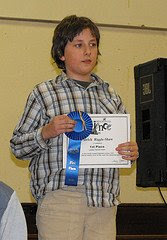 He placed first in his age group in the science fair and even made the local news. 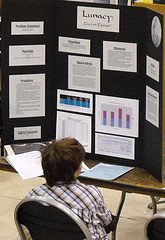 His project, “Lunacy: Fact or Fiction” was about whether or not the phases of the moon affect human behavior. Patrick obtained a breakdown of disciplinary actions in his school district and matched up the results with the phases of the moon. It turns out he was right. Students got into more fights and mouthed off more during the full moon. How many more fights or bad-mouths? Patrick said the chance that the correlation was mere coincidence was 2 in 10,000. So, if you’re having an unusually rough day with your kids, you might want to check to see if there’s a full moon! First, Patrick is my Godson. 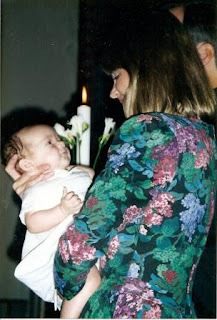 I was there with him when he was baptized in October of 1995. But we go back further than that. I was his mother’s labor and delivery coach, and Patrick’s was the first and only birth I have ever witnessed—I even cut the umbilical cord. We were bonded from the beginning. And then a couple of years later his mother remarried and they moved all the way across the country to Seattle. We miss him dearly, but Charli does a great job of keeping us in the loop on his progress. Which brings me to the second reason this story is blogworthy. Patrick isn’t just any bright kid who won a science fair award. He’s a bright kid with multiple neurological disorders, including Asperger’s Syndrome, who has overcome many obstacles to achieve all that he has. When he visited Memphis last summer, his service dog, Kudzu, came with him, and enlightened and entertained all of us at St. John, and later at Game Stop and out at lunch at Zinnie’s. We love you and we’re so proud of you! >Recently a group of eight writers from one of my writing critique groups did a writing exercise together. I call it “progressive flash fiction.” I started the story with a short paragraph, and then each writer added a paragraph or two and it continued for 2-3 rounds through all eight writers. (I say 2-3 rounds because a couple of people were too busy to contribute all three times, so we skipped them.) 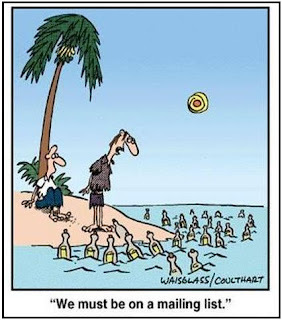 We just kept adding to the email thread and hitting “reply all” so we could all follow the story line as it developed. It was lots of fun, but at the end, when I asked how everyone would feel about me publishing it on my blog, several people were hesitant. Turns out they had concerns that some of the dialect might be offensive to our black readers and friends. Of course none of us intended that, and I certainly respect my fellow writers’ opinions, so I didn’t publish the story. But I’ve been thinking about it a lot this week. The story was set, by the second writer in the first round, in New Orleans. So, several of the writers used dialect we thought to be appropriate to the region. But it was “flash fiction,” so we didn’t spend a lot of time on it, and the finished product, which was indeed a rough first draft, could certainly use lots of editing. And the dialect could be brought down a notch. But we were writing from our gut instincts as Southerners who have grown up and lived in Louisiana, Arkansas, Mississippi, Alabama, Florida and Tennessee. And we certainly meant no disrespect. 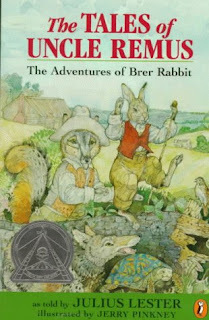 So, I decided to take a look at how several Southern writers have handled dialect in their work, starting with the most contemporary example I could think of. Fellow Jackson, Mississippi, native, Kathryn Stockett, and African American actress, Octavia Spencer, did a dramatic reading from Stockett’s new novel, The Help, at Lemuria Bookstore in Jackson recently. I brought my signed copy of the book home and devoured it immediately, savoring her colorful descriptions of time, place and people during the turbulent racial unrest of the 1960s South. … they’s a knock at the back door. I open it to see one a the workmen standing there. He real old. Got coveralls on over a white collar shirt. “Hidee, ma’am. Trouble you for some water?” he ask…. “Sho nuff,’ I say…. ‘How ya’ll coming along?” I ask. “Other fella need a drink?” I ask. “Beg a pardon,” he say, “but where…” He stand there a minute, l ook down at his feet. This is just a short sample, but there’s dialect all through the book, and I can’t help but believe that successful black actress, Octavia Spencer, who has over 100 television and movie credits to her name, must not have been offended by it, since she has chosen to join Stockett on her book tour and read the parts of the “colored help” while Stockett reads the white women’s parts. 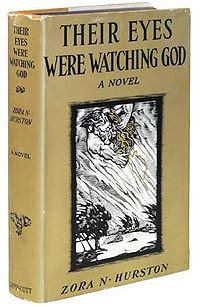 A much older example is Their Eyes Were Watching God, the 1937 novel and the best-known work by African-American writer Zora Neale Hurston. “The monstropolous beast had left his bed. The two hundred miles an hour wind had loosed his chains. He seized hold of his dikes and ran forward until he met the quarters; uprooted them like grass and rushed on after his supposed-to-be conquerors, rolling the dikes, rolling the houses, rolling the people in the houses along with other timbers. The sea was walking the earth with a heavy heel. This excerpt from Zora Neale Hurston’s book, Their Eyes Were watching God, is an example of her amazing writing. She makes us feel as if we are actually in her book, through her use of the Southern Black vernacular and admirable description. Her characters are realistic and she places special, well thought out sentences to keep us interested. Zora Neale Hurston’s art enables her to write this engaging story about a Southern black woman’s life. 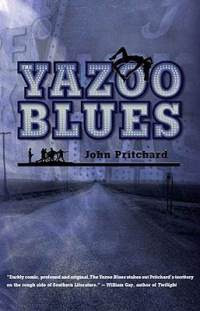 Mrs. Hurston uses Southern Black dialect through out the book. This is appropriate because all of the dialog is between Blacks who grew up in the deep South. Some authors that write in a dialect totally confuse their readers. However, Mrs. Hurston’s writing does not confuse us at all. One particular example of this is on page 102. Tea Cake starts off saying, “‘Hello, Mis’ Janie, Ah hope Ah woke you up.’ ‘Yo sho did, Tea Cake. Come in and rest yo’ hat. Whut you doin’ out so soon dis mornin’?’” Janie replied. This dialog is easily to understand. The reader really gets the feeling of the speech because reading it is just like listening to it. The book, written in black southern vernacular, has attracted criticism also by those[who?] who claim it portrays African Americans as ignorant (though Hurston herself is African American). Similar criticisms have been leveled at Twain’s Huckleberry Finn. But while Twain transforms the minstrel into a three-dimensional character, viewed through Huck’s revelations, Hurston uses black southern dialect to show that complex social relationships and common feats of metaphoric language are possible in something considered “substandard” to English. The phonetically-written speech of the African Americans in the novel not only gives context but also helps round out the aesthetic of the novel. While Hurston has been criticized for being condescending to her own people, a more critical analysis of the novel and the author reveals an earnest attempt at authenticity. Rather than appearing patronizing, the frequent dialogue is indeed the most oft-quoted and engrossing– often, as well, the most telling and philosophical. We all speak with the accent of the region we are raised in during the critical language learning period from 2 to 6 years of age. Your accent has nothing at all to do with intelligence or knowledge of the rules of grammar. It is simply a regional dialect and dialects are equally grammatical; they are simply slight variations in the grammar of a given language that characterize the various regions where that language is spoken. Black English developed in the Southern states when speakers of dozens of West African languages were abruptly forced to abandon their native tongues and learn English. Slaves from different tribes couldn’t communicate with one another–in fact, masters deliberately tried to separate slaves who could speak the same language. Since the Africans had to communicate with one another, as well as with the whites, a kind of compromise language evolved on the basis of English and a mixture of the original West African languages. Such a makeshift, compromise language, used as a second language by adults, is known as a pidgin. When a pidgin becomes the native language of the next generation, it becomes a creole–a full-fledged language. The African-English creole in the American colonies evolved into today’s Black English. Black English was most influenced by the speech of the southern whites. –loss of final consonants, especially sonorants: po(or), sto(re) like aristocratic southern English. — use of double negatives, ain’t, as in early English. –loss of ng: somethin’, nothin’, etc. Black English, in turn, gradually influenced the speech of southern whites–especially the children of the aristocratic slave owners. Given the social prejudices of the Old South, this seems paradoxical. However, remember that throughout all the slave owning areas, black nannies helped raise white children, and the children of blacks and whites played freely together before the Civil War. Since language features acquired in early childhood tend to be kept throughout life, Southern English naturally became mixed with Black English. Let’s look more closely at how Black English developed on the basis of West African Dialects. Whenever a group of adults is forced to learn a second language, the language learned retains many features of the original native language. Thus, the English of black slaves retained many features that were African and not present in English at all. The children of the slaves learned this form of English as their native language. Thus, on the basis of language mixing, a new dialect, called a creole, was born. This process–at least in some small degree– characterizes the English of all Americans whose parents spoke English as a second language. But in the case of African Americans, due to the social separation they lived under from the very start, the differences were stronger and more lasting. Main features carried over from West African languages. –No use of the linking verb ‘to be’ or generalization of one form for it. –emphasis on aspect rather than tense: He workin’ (right now) vs. He be workin’. This is found in many West African languages. –I done gone (from Wolof doon , the completive verb aspect particle + English ‘done’). –Regularization of present tense verb conjugation: He don’t, he know it. A large number of West African words came into Standard American through the medium of Black English: bug (bugu = annoy), dig (degu/ understand), tote bag (tota = carry in Kikonga), hip (Wolof hepicat one who has his eyes wide open), voodoo (obosum, guardian spirit) mumbo jumbo (from name of a West African god), jazz (? Bantu from Arabic jazib one who allures), banjo (mbanza? ), chigger (jigger/ bloodsucking mite), goober (nguba /Bantu), okra (nkruman/ Bantu), yam (njami/ Senegal), banana (Wolof). Also, the phrases: sweet talking, every which way; to bad-mouth, high-five are from Black English–seem to be either American innovations or loan translations from West African languages. The speech of African Americans gradually became more like the speech of their southern white neighbors–a process called decreolization. (And the speech of the whites became slightly more like that of the blacks). However, in a few areas, the original African English creole was preserved more fully. There is one dialect of Black English still spoken on the Georgia coast, called Gullah, which is still spoken there by about 20,000 people; it is thought to represents the closest thing to the original creole. After the Civil War, Black English continued to evolve and change, especially in the creation of new vocabulary. After the 1920’s millions of blacks migrated to northern cities, where various varieties of Black English continue to develop. There is one other notable southern English dialect. The Cajun French in Louisiana also adopted English with noticeable traces of their former language. 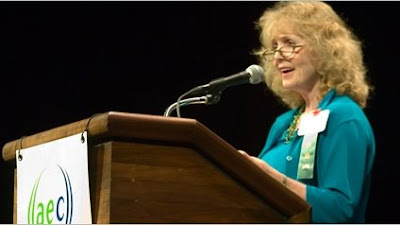 Next weekend I’m attending the Arts and Education Council’s Conference on Southern Literature in Chattanooga with keynote speakers Lee Smith and Jill McCorkle. Lots of great Southern writers will be there, including Wendell Berry, Bobby Ann Mason, Roy Bount, Jr., Clyde Edgerton, and many others. (I’m especially looking forward to seeing playwright Beth Henley, whom I went to high school with in the 1960s in Jackson, and haven’t seen since!) Anyway, I noticed on the program that one of the panels will be addressing this very issue that I’m blogging about today: “Borrowing Tongues: Writing To and From Another Race.” The panel will be led by Madison Smartt Bell, Allan Gurganus, Josephine Humphreys and Randall Kenan. I’ll be all ears. Check back after April 4 to see what I learned. Until then, it’s back to work on an essay I’ve been asked to contribute to a second anthology on Southern women and spirituality. Not a lot of dialect in it, but I’ll be paying closer attention to every syllable uttered! If you’re like me, you receive tons of junk mail in your (snail) mail box every day. I know I bring some of this on myself, because I’m a catalogue shopper. And it really doesn’t bother me too much, since it only takes a minute or two to toss it in the trash, after weeding out the goodies, like Bed Bath & Beyond’s 20% off coupon. And now that I’ve got Gmail, I get very little junk mail, compared with the amount I got when using Yahoo. Most of it lands in my Spam box anyway. But here’s what’s bothering me. It’s the random acts of Spamness that arrive in my inbox, often from friends, so I know I might be stepping on some toes here. Sometimes it’s 500 pictures of precious baby animals. Or a sentimental poem about best friends or mothers and children. Or maybe a warning about a catastrophic internet virus that turns out to be an urban legend. The point is, it arrives uninvited into my personal inbox, where it takes up my time because I have to do something about it. I can delete it without opening it, but then I take the chance that it might actually be something personal and valid. So I usually open it, see that it’s not something worth my time, and delete it. Without a pang of guilt as I ignore the final sentence, which often reads something like this, “Please send this to everyone you know immediately.” Not going to happen. Ever. Even if it tells me that baby animals will die if I don’t do it. I don’t like threats. I’m a writer and I work out of my home. Even so, I receive close to 50 emails some days. 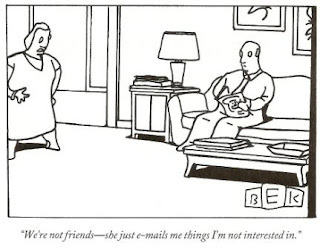 My husband, who is a physician, gets several times more emails a day than that. I can imagine the crowded email boxes of lots of folks who are in business, marketing, and other arenas which thrive on use of the social media. So, I’m asking: How do you deal with these random acts of Spamness? Do you censor the people who send you this stuff on a regular basis? Do you mark them as Spam? If you do, does that block those people from sending actual real, personal emails? How is this different than looking at your Caller ID before answering your phone, and deciding whether or not to answer it? Please leave a comment–I’d love to know your thoughts. I promise I won’t consider them to be Spam! In his homily this morning, Father John Troy commented on this hymn, saying that this feast is, in many ways, more significant (my word—I can’t remember his) even than Pascha, which is “the feast of feasts” in the Orthodox Church. He went on to say that at Pascha we celebrate victory over death, which is something he can wrap his mind around better than what happened at the Annunciation, when God entered Mary’s womb, which was truly the beginning of our salvation. It is, indeed, a great mystery. I wanna taste the taste… and fix the problems. I wanna run headlong into chaos..and bad guys..and darkness..and pranks..and fun..and laugh laugh laugh. and I wanna be known. I think I love this character because she is so alive. And so honest and real. She goes after life with everything she’s got. And she’s got plenty of wounds—she was sexually abused by a Catholic priest as a child, and her sister was killed by Timothy McVeigh in the Oklahoma City bombing of the Alfred P. Murrah Federal Building. 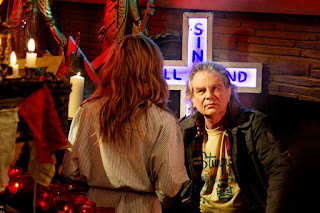 Powerful backstory—kudos to series writer, Nancy Miller. Watch an interview with her here, where she talks about the mystery of God and His love for us, how life is messy, and the importance of writing the truth. Not an exchange you’d expect between a woman and her angel. Not at all like the exchange between the Virgin Mary and the Archangel Gabriel. Last year on this day I was preparing to teach an iconography class. And yes, I still need to finish the two icons that Kerry and I have been working on for the nave for about two years now. We’ve scheduled days to work on them together twice during Lent this year, but we’ve each had to cancel once. I’m so into my writing projects that I’m having trouble pulling away from them and getting back to painting icons. Maybe painting icons is an important way for me to embrace my grace. But not today. Maybe soon. 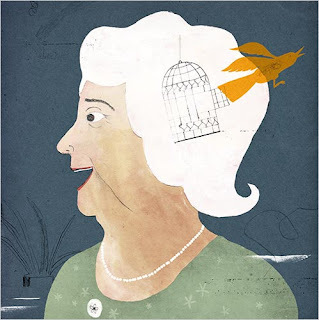 First, the Sunday New York Times had a wonderful article by Robert Leleux, author of The Memoirs of a Beautiful Boy, called “A Memory Magically Interrupted.” It’s about his grandmother’s experience with Alzheimer’s. Actually, it’s about the upside of Alzheimer’s, something you don’t see in print very often. Although I’ve mentioned the way that the disease has actually changed my mother’s personality into one that is, well, less judgmental. And like Leleux says of his grandmother, Mom actually seems happier at times. None of this is to take away from the awfulness of the disease, but perhaps just to find something upbeat to say about it. Great article—if you are caring for, or close to someone with Alzheimer’s, you should read it. “At the age of eighty my mother had her last bad fall, and after that her mind wandered free through time. Some days she went to weddings and funerals that had taken place half a century earlier. On others she presided over family dinners cooked on Sunday afternoons for children who were now gray with age. Through all this she lay in bed but moved across time, traveling among the dead decades with a speed and ease beyond the gift of physical science…. The third gift also came from my friend Jere Hoar. Knowing that I’m a student of the written word, he emailed me yesterday, recommending these DVDs from The Teaching Company, “Building Great Sentences: Exploring the Writer’s Craft.” The set includes 8 DVDs with lectures by Brooks Landon at the University of Iowa. Regularly priced at $254.95, the set is on sale now for $69.95. I ordered them this morning and can’t wait for this next step in my “continuing education.” Thanks for the tip, Jere! Wish I could spend the day reading Russell Baker’s memoir. Or working on mine. But today’s not a writing day. It’s a day to pay my mother’s bills, since her memory has been magically interrupted, and to take care of some of life’s less exciting activities, like grocery shopping and exercising. Hey—maybe I can read while I’m on the elliptical machine. Whatever the day may bring, I’m thankful for these gifts. And Thy holy resurrection we glorify! We sat outside in the courtyard for a while, because the weather was gorgeous, and Mom loves the birds and trees and flowers. But her mind has slipped even more since my last visit a few weeks ago. She’s had two falls, and they’ve had to put a lap guard on her wheel chair because she can’t remember not to get up and try to walk by herself. As we talked, I saw the wheels turning behind her glazy eyes, but she struggled to find the words to describe what she was thinking. At one point, she said, “You know, it’s kind of two, three, four,” and she made a motion with her hand as if she was placing items in a row on a table. “And then six, seven, eight,” the movement continued. At another point she said, “I work all day on Mondays, just going zoom-zoom here and zoom-zoom there,” and she made a motion as though turning the steering wheel of a car. “But then I can rest the other days of the week.” And then she smiled. Who knows what she’s remembering, possibly something from her very active life many years ago, when she was taking care of my brother and me, or teaching school, or helping my father run the business they owned and operated from 1982 until 1994—Bill Johnson’s Phidippides Sports. After a while, Charles wheeled his electric scooter chair over to join us for a visit. Charles is 55. I wrote a post about him in January, here. At the time, I thought Charles’ disability had been caused by a stroke he had suffered as an adult. It was just a guess. But yesterday I learned the truth. When Charles was about 8 years old, he got sick with St. Louis Encephalitis, a virus that invades the central nervous system, including the spinal cord and brain. As Charles struggled to form intelligible words to describe his story, I watched Mother, who picked at the crumbs from the cookie I had brought her earlier, which were now stuck to the plastic wrap in a wad on her lap guard. I didn’t know if she could understand Charles’ words or not, so every few sentences, I would “interpret” them for her, to include her in the conversation. Charles’ mind is sharp. He and Aubrey carried on a conversation about politics and the folks who run Jackson, “America’s City of Grace and Benevolence,” and their hopes for a better mayor in the upcoming election. Aubrey is a lawyer and works for the Attorney General’s Office. Watching him talk about his life, I notice how beautiful his eyes are—deep blue, with a twinkle. And what a handsome face he has, with nice bone structure and pretty hair. You have to look past the drooling, and his inability to make his mouth and facial muscles work the way he wants them to. His right foot had slipped off the platform at the base of his scooter, and it’s paralyzed, so he asked me to put it back up for him. So, this morning I thought about Charles’ cross, and suddenly mine didn’t seem as heavy. Half-way through Great Lent, and I have not really yet begun to repent. But maybe this past week at the beach, and my visit with Charles at the nursing home, reminded me to be thankful, and thankfulness can certainly lead to repentance. Returning to Memphis after being gone for almost a week, I couldn’t help but notice that Spring arrived while I was away. 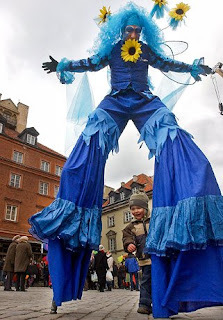 Check out these costumed figures parading on stilts as part of the Polish celebration of the vernal equinox. 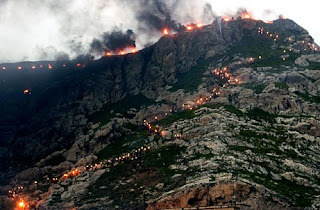 And near ‘Aqrah, Iraq, on March 20, 2007–Torch-bearing Kurds gathered in the countryside to celebrate Nowruz in Iraq, where the Persian vernal equinox celebration is marked by fire, dancing, music—and journeys into the wilderness. And is being watched over by this little squirrel. The squirrel is also very interested in this bird’s nest that’s just been built on the top of this column on our porch, just a few feet from our front door. The bird flies away when I go out to take a picture, but then I can watch from the window as she comes back in to finish up with construction and rest for a spell in her new digs. Maybe I can sneak a photo when the babies are born. And so I welcome Spring, and the second half of Great Lent, with a heart full of thankfulness. With God’s help, I will try to take up my cross with less grumbling. And I’ll try to seek humility, so the devil won’t have as easy access. 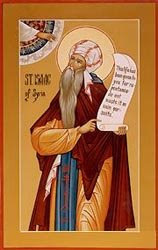 In his wonderful homily at St. John this morning, our Assistant Pastor, Father Nicholas, talked about how people who walk around with their heads lifted arrogantly are easy prey for the devil, because the devil reaches up to snare us. He said the devil can’t reach down, so when we humble ourselves (at that point Father Nicholas made a gesture of bowing) the devil can’t get us. His words reminded me of something Jere Hoar told me when I was visiting on his front porch in Oxford on my birthday. It was about Daisy, his Llewellin English Setter. He told us that she had been attacked by several dogs because she carried her head in the air, acting like she was better than the others. She seems to have settled down now. Maybe she’s learned some humility. Like Charles Wilkins Walker in the nursing home. I bet the devil wouldn’t dare reach down and bother Charles. If you would be victorious, taste the suffering of Christ in your person, that you may be chosen to taste of His glory. For if we suffer with Him, we shall also be glorified with Him. 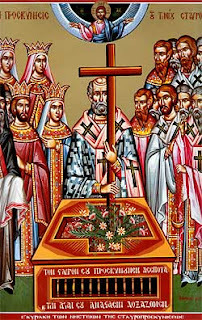 Behold, for years and generations the way of God has been made smooth through the Cross and by death. The way of God is a daily Cross. The Cross is the gate of mysteries. I took these pictures of sand castles this afternoon… my personal favorite is the mermaid, but it’s hard to see from the side. I posed beside the pyramid because of the Memphis connection. corny, huh? And the boys from the University of Alabama were so proud of their Beer Pong table they posed behind it and asked for a link to my blog. Hi, boys! Now, on with philosophizing about castles in the air. Writing can be like that. First you dream. You imagine that short story, that poem, that novel. Or you envision that essay or that memoir. You might do a half dozen outlines and a couple of really bad first drafts (okay, I guess there’s no such thing as more than one first draft) and finally you get down to the hard work of building a foundation under that initial dream. That’s what this writing retreat has been about for me. I’ve been dancing around those castles that I built in the air for a few years. First I wrote a novel but the characters were strapped with the impossible task of disguising truths that begged to be told. Not that fiction isn’t about truth. The best fiction reveals the truth more vividly that lots of nonfiction. But the genre wasn’t working for me. So, I published a few essays, and then got to work outliing a memoir. I got just over halfway through drafting it when I got stuck. Because I needed some space so I could create art, and not just record events. A memoir is not an autobiography. It’s a reflection on certain aspects of a life or events or people. I just made that definition up. Hope that’s right, ’cause that’s what I’m writing. Now. I didn’t make that up. So, I made lots of progress this week, and tonight I said goodbye to the beach… caught this guy boogie boarding just before sunset. And finally I pulled up my umbrella and chair and put them in the trunk of my car for my departure early tomorrow morning. I’ll stop in Jackson to visit my mom. The nursing home called this morning to say they finally had to put a lap guard on her wheelchair to keep her from getting up and falling again. It’s a last resort–this morning they found her sitting on the floor by her bed, unhurt, but confused. She just can’t remember that she can’t walk on her hip because it never healed properly. What else can they do? I’ll pick up some soft cookies from McAllister’s Deli, Mom’s favorites, and hopefully bring some sunshine from the beach into her life tomorrow. I’m sad to leave the beach, but I’ll be happy to be home with hubby and Oreo tomorrow night. G’nite all. McCorkle is a proponent of writing that gives “a realistic portrait of human nature” and the freedom to use words that are needed to paint that portrait. Enjoy the essay. Click here. For those who read yesterday’s post, here’s an update on my mom: I talked with the nurse on her wing at the nursing home today, and she said Mom “took her morning meds without being combative” and doesn’t seem to be in any pain from her fall yesterday. And … she doesn’t remember what happened. No memory of the 6 hours she spent in the emergency room either. The mixed blessings of dementia. Early this evening I drove down to Orange Beach (10 minutes from Gulf Shores) for some fresh crabmeat and shrimp at Louisiana Lagniappe, and enjoyed sunset on the docks of the San Roc Cay Marina. This is my favorite photo at the bay. >Remember the words from my Morning Prayer that I shared on Tuesday? So, how come my first response when I got the call this afternoon from Jackson that my mother had fallen in the dining room at her nursing home (300 miles away) and was in the emergency room at the hospital wasn’t peaceful? How come my first thoughts weren’t, “Thy will governs all”? It was such dejavú—from the last time I was at the beach, in October. I had driven to Seagrove with my husband for his recovery from surgery when I got the call that Mom had fallen the first time, which resulted in 2 surgeries, rehab and finally a permanent move to the nursing home. The call came after a morning of writing today before heading down to the beach to relax for a while. I had just gone for a walk and had settled down to work on editing my morning’s work when my cell phone rang. So, I spent the next 6 hours communicating (or waiting for a call to be returned) with the people at the emergency room and the nursing home, angsting over whether or not I needed to hop in the car and drive to Jackson. To make a long story (that doesn’t cast the emergency room folks in a good light) short, the good news is Mom didn’t re-break her hip, and she’s back at the nursing home with only a small cut on her head. I’ll see her Saturday on my way back to Memphis, but it’s hard not to feel like a bad daughter for not being with her at the emergency room today. I’m thankful for a good friend who told me I’m a Good Daughter. If you’re new to my blog, you can catch up on my long-distance care-giving episodes here. Meanwhile back at the beach, I enjoyed meeting Phil and Karla Hardin from Jackson (Mississippi) yesterday, and today Phil and I had a great visit about writing and other stuff. Phil moved to Clinton, Mississippi, from Pennsyvania to attend Reformed Theoogical Seminary. He and Karla still live in Clinton, where they have a counseling business, Passionate Living Counseling. Turns out their daughter, Abigail, a student at Alabama, has a children’s book coming out, Look At Me, I Am Just Like You, which she is signing next Friday, March 27, at Lemuria Books in Jackson. Small world, the beach. And Mississippi. Almost as beautiful as this one, last night on the canal by Lulu’s, where I went to take in some local music. Maybe tomorrow I’ll do a better job of remembering.